How do you successfully navigate the long and often complex book called the Bible? 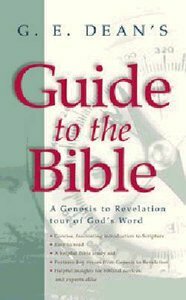 Here's an idea - the Guide to the Bible, a Genesis to Revelation tour of God's Word. G. E. Dean, author of Bible Secrets for Successful Living, has written a user-friendly introduction to Scripture, by listing key verses from the Bible and coupling them with his own brief insights. Its a great aid for spiritual novices just delving into Gods Word, or for seasoned Christians who want a new viewpoint on important passages. - Publisher Vacation in a strange country, and you hire a guide to show you where and what to explore. That's what Dean has done for the land of Scripture. From Genesis through Revelation, key verses are paired with brief, easy-to-read insights. The topical index makes cross-referencing easy. An ideal devotional or introduction to God's Word. - Publisher Dean has written a user-friendly introduction to Scripture by listing key verses from the Bible and coupling them with his own insights. About "Guide to the Bible"
Vacation in a strange country, and you hire a guide to show you where and what to explore. That's what Dean has done for the land of Scripture. From Genesis through Revelation, key verses are paired with brief, easy-to-read insights. The topical index makes cross-referencing easy. An ideal devotional or introduction to God's Word. Dean has written a user-friendly introduction to Scripture by listing key verses from the Bible and coupling them with his own insights.